Gaming profile is: 7 sharpness,15 black,temp 100 100 100,blur reduction ON,rest standard.I edited those in FPS1 setting and saved in gamer2 to be able to swap them fast,is there any problem with my settings/that i edited in fps1? I installed the strobe utility,ran it,and i`m confused about the settings for Persistence and Crosstalk. At the moment i have Persistence at 12 and crosstalk at 0,but i dont know if they are good settings. Should i keep using Strobe utility in this scenario? and if the answer is yes,what settings for Persistence and Crosstalk should i use for low input lag(=butter smooth gameplay) without sacrificing all blur reduction? Blur reduction modes can amplify visibility of microstutter, so you must compensate by being smooth at everything else. - Adjust your mouse sensitivity. .........(A) overkill framerate (300fps+ in CS:GO) if you prefer VSYNC OFF. Excess framerate compensate a lot for the microstutter of unsynchronized framerates. .........(B) OR cap framerate to refresh rate. Most common is VSYNC ON but there are other low-lag tricks / RTSS scanline capping trick to move tearlines off edge of screen. Personally, when I play solo player when strobed, I tend to prefer VSYNC ON since that's reliably keeping everything smooth during strobed oepration. But it's bad for lag for competitive gameplay, and requires lots of tricks to get low-latency equivalents of VSYNC ON. At the end of the day, it's just easiest to uncap the framerate or use ultrahigh framerates (300fps+); it will have slightly more microstutter than VSYNC ON but using overkill framerates+VSYNC OFF is still a hell lot less lag and less fiddly for strobed operation. .........(C) There is an option (C) called the ULMB+GSYNC hack (75Hz-155Hz) but it is not for the faint of heart and only works well on 240Hz GSYNC monitors and has major flicker problems in most games. Item (A) is far by the easiest. Fixing microstutter is useful for non-strobed operation, but is super especially important for strobed modes since the clarity of strobing (e.g. ULMB) amplifies microstutter visibility -- motion blur historically masks a lot of microstutter -- and the lack of motion blur makes microstutter hugely visible. That's why a lot of people say "ULMB looks jittery" or "Blur Reduction looks very stuttery" when it doesn't have to be, after sufficient tweaking. Fix that first. Now you can focus on fixing the double-image problem. For this, use TestUFO crosstalk test to calibrate blur reduction mode. Adjusting the position of the crosstalk with Strobe Utility can let you decide what part of the screen you want to have the lowest lag. By using the built-in TestUFO test, you can tell what part of the screen has the worst crosstalk. The lowest lag always occurs in the area right above the crosstalk bar. 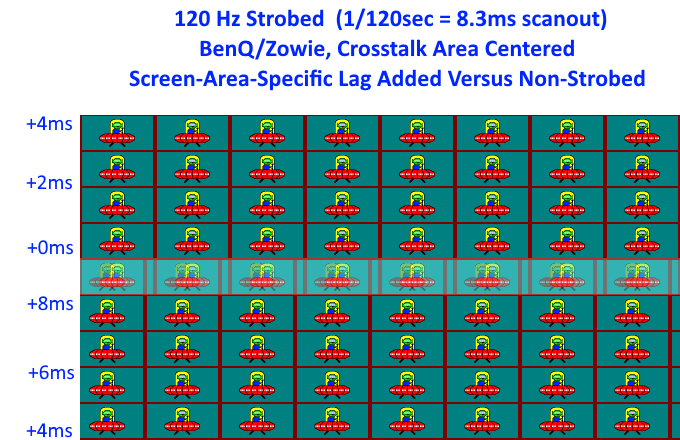 These diagrams tell you how you can customize your input lag of your blur reduction mode, based on the location of the crosstalk bar. Now, if you are prioritizing for zero crosstalk, you definitely want to use a slightly lower Hz (e.g. 120Hz instead of 144Hz) and try the Large Vertical Total tricks on your XL2411P. 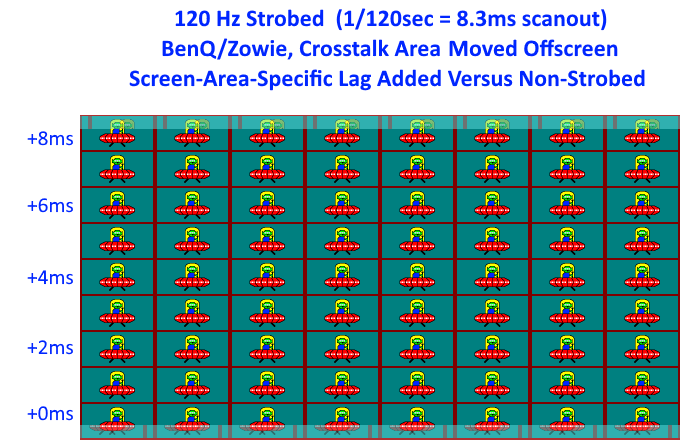 Your monitor is capable of the VT1502 trick, which is capable of hiding nearly all the strobe crosstalk offscreen (large 422-line blanking interval between 1080p refresh cycles provide plenty of time for LCD pixel transitions complete between refresh cycles). The lower the Hz, the less crosstalk you will get. The larger the VT you can get, the less crosstalk you will get. Then whatever crosstalk you have left, you can adjust the crosstalk bar upwards/downwards. Adjust "Persistence" to user preference. Look at the dots of the UFO eyes as you adjust. Lower persistence settings will mean clearer motion but darker. For competitive gameplay, you'll want to keep it almost maxed brightness, since brightness is usually more important. But adjust to preference.